one click for m4's arm scaling issues. Also apply to clothing. This fixes the smoo zone that DAZ put on backwards in the base Michael 4 figure. You see the error as a jagged edge anytime you scale the armns up, as in the Freak 4 morph. DireLilith (5 months ago) Inappropriate? yay!!!!!!!!!!!! this is STILL relevant and you are STILL awesome for sharing this! Muahmuahmuah!!! Andrew_C (6 months ago) Inappropriate? Thanks! That bug in M4 is extremely annoying. Yoshimi (1 year ago) Inappropriate? Thorneldrich (1 year ago) Inappropriate? TYVM! You have solved a very annoying situation for which I had not found a cure. You my friend are a lifesaver! marianner (2 years ago) Inappropriate? ssgbryan (2 years ago) Inappropriate? Thank you very much. This is quite handy. aiel777 (2 years ago) Inappropriate? Thank you for this very useful fix!!! I know how to fix the problem but there were just too many steps, this just makes my day!!! DireLilith (2 years ago) Inappropriate? aeliu (2 years ago) Inappropriate? revengar (2 years ago) Inappropriate? WillShetterly (2 years ago) Inappropriate? Thank you! It's appalling that Daz never fixed this. albino (2 years ago) Inappropriate? This is useful. 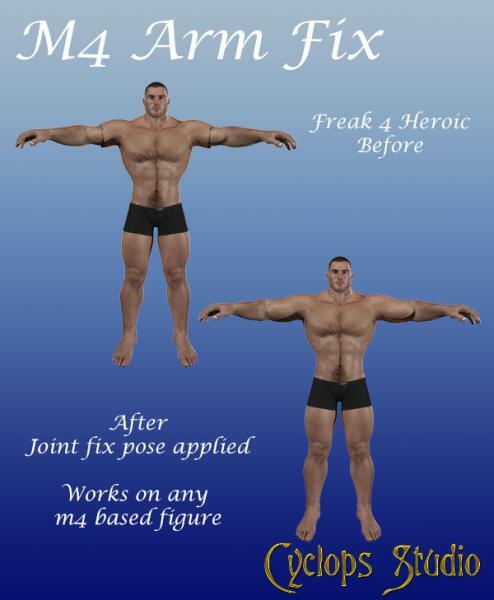 I have had that weird arm problem before with M4 in Daz. Thanks! howy2012 (2 years ago) Inappropriate?